Several times I checked the early loaves, fearing that something may have gone wrong and in all honestly just sheer impatience was leading me to lift the lid more than I should have done. 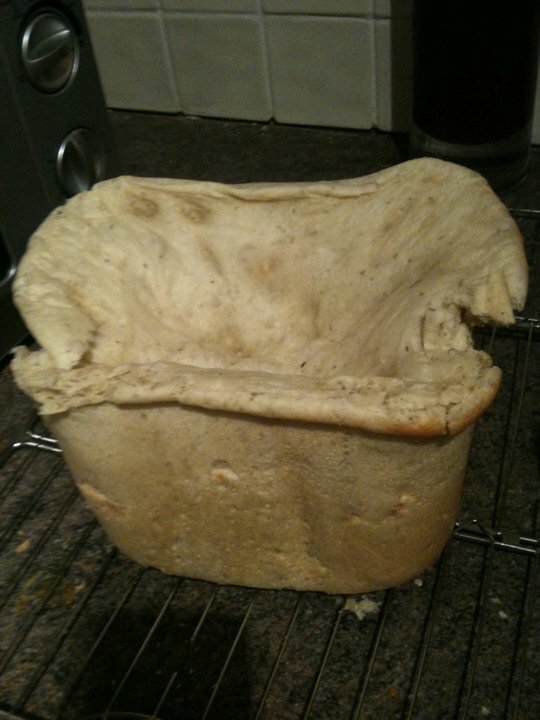 When I went to check this, it looked as if the loaf was starting to drip down the sides of the pan, leading me to worry that the whole machine would explode in a fit of ridiculous overworrying (something which this blogger is all too known for). Appearances are deceptive - this was another very tasty loaf. It was also another monster. Sadly, the packet mix that I bought to make this offered a 400g, 600g or 800g size of loaf. My breadmaker makes 500g, 750g or 1kg loaves. Now, really, I could have worked this out a little more sensibly and used a bit of maths. Feeling that was far too boring, I just whacked it all in and hoped for the best. Possibly the best idea - the breadmaker doesn't seem to have a sizing option for the packet programme. This bread was particularly tasty with my favourite open sandwich - mayonnaise and raw mushrooms. I'd normally add a bit of garlic but as the focaccia already had some, it wasn't needed. For the second half of this post I'm going to escape from the bread related discussion - as I do intend to share some other recipes too. Again, fear not, there are far more discussions about bread to be had - I still have to share my experience with naan bread and pizza dough yet - but that's for another day. Tonight I made a Tuscan bean stew. It worked quite well if I do say so myself. Soften the shallots for about five minutes on a medium heat. Add the carrots, celery, garlic and courgette and allow to soften for a further five minutes. Add the butter beans, vegetable stock and tomatoes, allow to simmer for fifteen minutes. Serve sprinkled with the cheese and basil leaves. Final comment to be made on today's blog is about equipment - I have much to discuss about some recent additions to my kitchen but would like to draw your attention to the lovely piece of kit that can be seen in the cooking photo. It's my wok. I love my wok. I use it for an awful lot of my cooking, from stir fries to chilli to spaghetti bolognese. I even once, foolishly, tried to make pancakes in it. It's a Kwok. 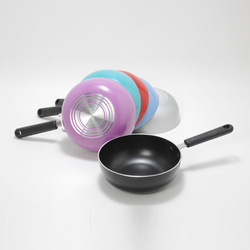 A Kwok is supposed to be a cross between a frying pan and a wok. I struggle to see the point. You're left with something that isn't big enough for your stir fries and just looks a bit wrong. It's basically a pan with slightly more curved sides that is slightly shallower than the normal pan. Sure, the colours are cool but the concept? To say the least, naff. I'll be sticking with my trusty wok. I'm off now to check on my french bread - which I believe has taken over the breadmaker in a similar way to the focaccia. More on that later.